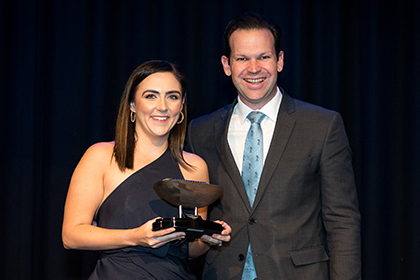 THE resources and energy industry’s shining stars were celebrated at the AMMA Industry Awards in Melbourne on Wednesday night (1 August). 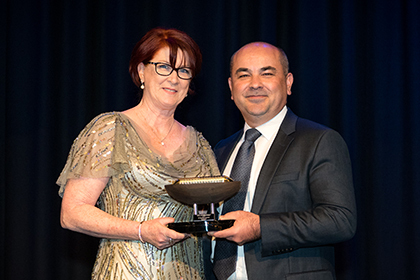 Presented by Australian Resources and Energy Group AMMA, the prestigious awards were the highlight of industry’s biggest celebration of 2018 at the AMMA Centenary Gala Dinner in Melbourne. Attended by leaders of the resources and energy industry, political, business and industrial relations community, the awards celebrated leadership, innovation and excellence in the sector. 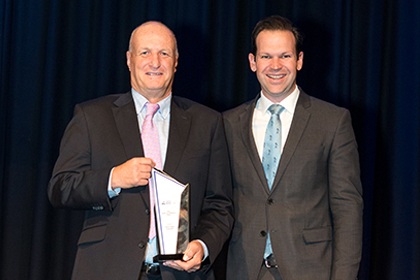 AMMA Chief Executive Steve Knott praised the high level of award winners across six categories covering key workforce-related areas of the industry. 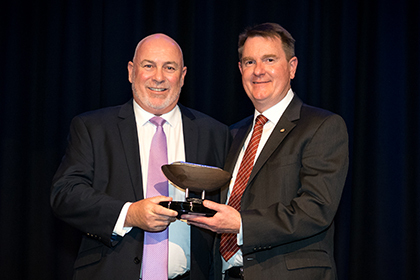 “The calibre of this year’s award winners again highlights the tremendous work being undertaken by individuals and organisations across Australia’s resources and energy industry,” he said. “It is always a highlight to recognise the abundance of talent in our sector, but coinciding with AMMA’s centenary celebrations, the presentation of this year’s awards in front of more than 500 industry, political and industrial relations leaders was extra special. Australia’s standing as a global leader in key workforce areas was solidified by the impressive talent shown by award winners, Mr Knott said. “The people in Australia’s resources and energy industry are always challenging themselves to seek improvement in workforce and operational practices,” he said. “It is incredibly important we celebrate the brightest minds of our sector who are striving for excellence and innovation across training, diversity, and health and wellbeing – these are the people and organisations driving our industry to ensure a brighter future for all Australians. 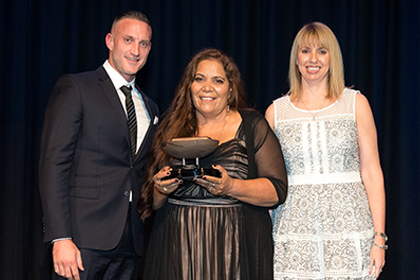 The Indigenous Employment and Retention Award recognises an organisation that has implemented a training and/or employment initiative resulting in the successful engagement of Indigenous Australians within their workforces. Perth-based NPJV launched in November 2016 with only three employees and an ambitious plan to introduce a new concept in Native Title contracting. The company now employs over 60 people with 50 per cent being Njamal People and it competes for and wins work based on its professional business model and outstanding track record. In 18 months the company secured more than $15 million in contracts, with 75 per cent employee retention rate. The Innovation in Training and Development Award celebrates an organisation that has implemented a training program or initiative which has contributed to the organisation’s overall success. Operating in the oil and gas industry, with remote site operations, Quadrant identified that real life training in emergency management was difficult to conduct. This year Quadrant identified an opportunity to address the challenge of giving offshore workers real life emergency experience. By expanding their annual training, the company included an enhanced incident response component, with a full day of training that simulates extreme environments and focusing on multiple casualty scenarios. Judges were impressed by how the newly-formed Annual Medical Workshops surpassed all expectations and learning objectives, with feedback from all attendees praising the curriculum, training methodology and specific skill capability development. The Australian Women in Resources Alliance Award recognises an organisation that has developed innovative or highly effective strategies to increase women’s participation in the resource industry workforce which has directly enhanced the success of the organisation. St Barbara developed a diversity strategy that incorporated key objectives relating to gender composition, pay equity, return to work, data analysis, reporting and attraction. 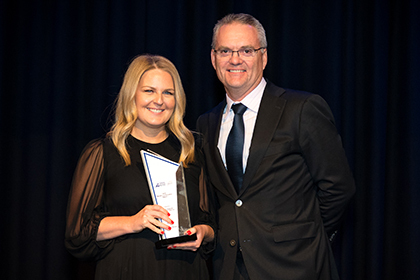 St Barbara has been honoured to receive the Workplace Gender Equality Agency Employer of Choice citation each year from 2014 to 2018 and is currently the only mining company in Australia to be awarded this recognition. Among a number of successes in gender diversity, St Barbara has increased the number of women in its overall workforce to 24% in 2018, and women in its corporate offices increased from 34% in 2010 to 48% in 2018. The Workforce Innovation Award recognises the creative and strategic efforts of organisations and individuals to overcome workforce challenges and deliver quality outcomes for communities and individuals in the resources, energy or related services industries. Sodexo used innovative technology to transform the way the company undertook mental health training in the form of Gamified Micro-learning. In addressing the challenge to create tailored mental health training, Sodexo produced and deployed an 8-week ‘I Hear You’ Gamified Micro-learning curriculum to 130 people managers. Micro-learning provides information in short, focused bursts, using spaced repetition, with Gamification working by enticing the learner to complete repeat lessons, for better engagement and retention. Judges were impressed by the high completion rate and the fact it was used via a smart device, meaning busy site-based managers did not have a barrier to complete the training in their schedules. The Health & Wellbeing Award recognises an organisation that has implemented a leading health, safety and wellbeing initiative that has made a significant positive impact on its workplaces and employees. Gold Fields Australia has implemented a Dynamic Neuromuscular Stabilisation early intervention and wellness program, including sessions with specialist practitioners to proactively reduce health risks, early intervention in physical rehabilitation and expedite recovery and decrease non-work related injuries transitioning to work-related injuries. The program’s success rate with improved health outcomes impressed judges. This Award recognises an individual who, in a short period of time, has had a positive and noticeable impact on workforce-related processes or practices within their organisation. Shelby Bailey is an Industrial Relations Advisor with Atlas Professionals. Working within a complex industrial relations environment, Shelby has been outstanding in the areas of enterprise bargaining, redundancy processes, unfair dismissal applications, Modern Award application, grievance and discipline actions. The judges were particularly impressed with Shelby’s successful stakeholder engagement and management for her organisation’s current enterprise agreement negotiations, in particular interest-based bargaining in the Fair Work Commission. Shelby has developed and driven IR strategies, using her own knowledge, experience and research talents, creating cost savings for the company. She has only been with Atlas Professionals for a short period of time but has already had a positive impact on its people processes and practices. High-res images of the winners are available upon request.